India's attempt to blackmail China into concessions is destined to fail and the Doklam standoff has fundamentally changed how the country is viewed by China, from a friend to a rival, experts interviewed by the Global Times said Tuesday. Indian Prime Minister Narendra Modi said Tuesday that "Our armed forces always proved their mettle in handling both extremism and during war. Even the world acknowledged our power after the surgical strikes. National security is our priority," the Economic Times reported. "Modi's speech shows he wants to divert public attention from domestic problems to foreign affairs, especially security issues. India has a lot of domestic problems, including a horrible incident at a hospital which killed dozens of children, as well as massive protests in several places. He hasn't been able to effectively deal with these issues, so he might consider that making problems with China will minimize the domestic impact on his administration," said Hu Zhiyong, a research fellow at the Institute of International Relations of the Shanghai Academy of Social Sciences. "China will not show tolerance toward India, but the timing is very important. 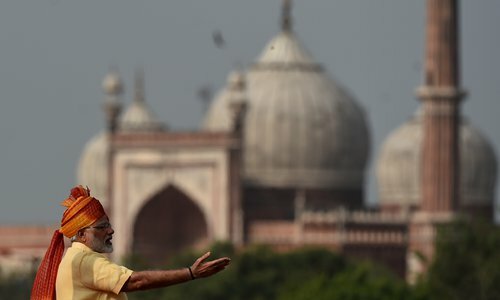 From 1959 to 1962, China gave India three years to change its mind," said Chu Yin, an associate professor at the University of International Relations. The border frictions in 1959 started when India crossed the Line of Actual Control in South Tibet to support a Tibetan independence rebellion. In October 1962, China pushed back and gained an overwhelming victory against India in just a month. Chu said the current situation is different from 1962 as the incident is happening in a non-disputed area within Chinese territory, so military measures this time may be touch and go. "The BRICS Summit will provide a chance for both countries' top leaders to talk, and it's very likely this will be the last opportunity for peace," Chu added. The upcoming BRICS summit will be held in China's southeastern coastal city of Xiamen, Fujian Province, in September. It will be an important event in China's "domestic diplomacy" this year. A major reason why India refuses to withdraw its troops from Chinese territory is that it believes China has more important issues to deal with this year than border issues, said Ye Hailin, director of the National Institute of International Strategy, Chinese Academy of Social Sciences. These include the BRICS summit and the 19th National Congress of the CPC, so India believes China will not punish it in the end. The only "achievement" that India gets from the Doklam incident so far is that it has successfully changed China's view of India from that of a friend to a rival. Once China identifies anyone as a rival, its policy toward this country will change fundamentally, Ye said. In the midst of the evolving security situation in the region, India and Russia will hold mega war games in October, involving their armies, navies and air forces for the first time to further ramp up military ties. The drills will be held in Russia from October 19 to 29 and will focus on achieving coordination between the forces of the two countries in a tri-services integrated theater command scenario, an Indian military source told the Indian Express. "The joint exercise is a routine military exchange between India and Russia and it was planned much earlier than the Doklam incident, so there is no need to link this to the border standoff between China and India. The Russian government isn't picking sides on this issue," Hu said. Just like Russia, the US also refuses to choose sides between China and India, and I would like to remind Indian politicians, that even in 1962, the US didn't provide any help to India during the conflict, and the US has a bad track record on betraying allies, especially semi-allies, Ye said. The 1962 border conflict occurred at the same time as the Cuban missile crisis.